Today is Anti-Slavery Day in the UK – an opportunity to raise awareness of modern slavery and the role governments, businesses, charities and individuals can play to address the issue. A hidden and pervasive crime, modern slavery is estimated to effect 136,000 people in the UK alone. 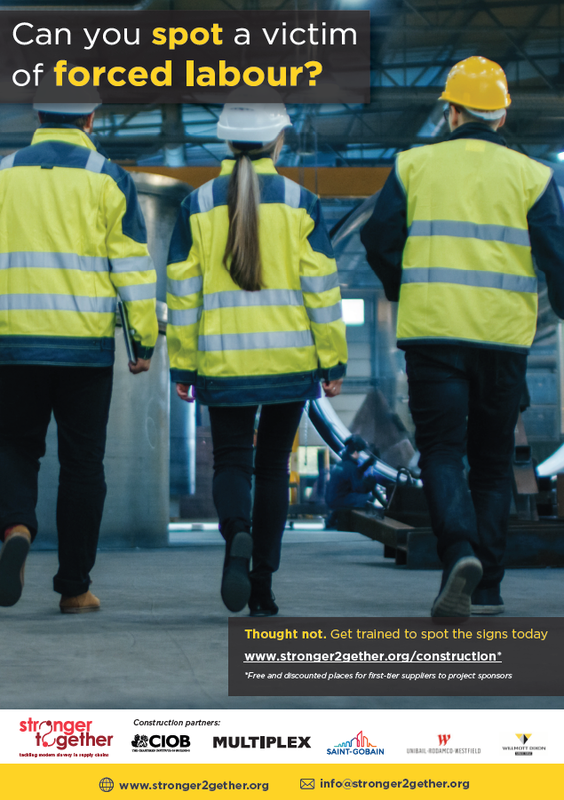 This year at Stronger Together, we have worked with our project sponsors in consumer goods and construction to raise awareness in their business and supply chains of the signs of forced labour and what to do if someone notices something suspicious. To encourage people to discuss the facts of modern slavery we have drawn together three common misconceptions of modern slavery below. Forced labour is a systemic human rights abuse which can affect any industry in any country, though some sectors are said to be higher risk than others. On an individual level, the products and services you buy may also rely on forced labour; common high-risk services include hand car-washes, nail bars and takeaways. Modern slavery is often said to be ‘hidden in plain sight’, but if you understand the signs that someone may be a potential victim of modern slavery then you are more likely to be able to identify them and respond appropriately. To be wearing inappropriate clothing for the work they are doing. There are also many red flags within a business that can be indicators workers may be being exploited such as numerous unrelated workers providing the same contact address or numerous workers providing the same bank account details. Understanding the signs of forced labour will mean you are more likely to be able to identify a potential victim and respond appropriately. Step 3 Implement our free resources including printable posters, toolkits, checklists and videos to put in place what you have learnt.